Inspection - Sewer Technologies Inc.
Sewer Technologies Inc. offers various no-dig methods for analyzing the physical condition of sewer lines. Pipe defects can be identified in all sizes of storm and sanitary pipes from 50mm to 3000mm. Our fleet of trucks are equipped with the industry’s most state of the art equipment. Each of our inspection vehicles has digital data-capture systems using Win-Can®, which is the market’s most innovative data collection and data analytics software. Our CCTV Inspection systems and operators are the most efficient in the industry today. All operators are certified in NASSCO’s Pipeline Assessment Certification Program (PACP). CCTV Inspections are completed in accordance to OPSS (Ontario Provincial Standard Specification) 409 Construction Specification for Closed-Circuit Television (CCTV) Inspection of Pipelines. 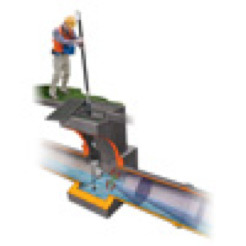 The inspection of sewer laterals is a vital tool for identifying infiltration and inflow, root infiltration, accumulation of debris, pipe defects, and the overall structural condition of lateral sewer services. The easiest and most non-intrusive method for these inspections is completed via the Lateral Launching process. Lateral Launching/locating can also be used prior to horizontal boring for precisely locating lateral services, and avoiding costly damage to the existing infrastructure during the boring process. Our Lateral Launching CCTV system is designed to crawl down mainlines that are 150mm and larger, and then insert its camera into the adjacent lateral service. An integral SONDE transmitter (available in standard frequencies) makes locating the camera from above ground quick and easy. The auto-levelling colour camera with shadow less LED illumination pans and tilts to capture exceptional sidewall detail. Twin bands of shadow less LED illumination combine with an auto-upright camera and 600×800-pixel display to ensure maximum detail. A colour text generator displays operator annotations and graphics onscreen, as well as camera distance. These systems are also equipped with a rear-view camera, auxiliary lamps and steerable 6-wheel drive essential for manoeuvring to troublesome launch points. This software-guided launcher monitors pushing force during the launching procedure to prevent damage to the cable and camera. The reporting for this camera system is generated through our WinCan software. 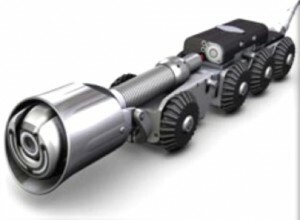 CCTV inspection units consist of a remotely operated camera, mounted on a self-propelled robotic crawler that is connected to a video monitor at the surface. These systems are contained within a cube van and operated by a certified CCTV Technician. Determine structural condition of the storm and sanitary sewers, watermains, electrical conduits etc. Locate obstructions such as debris roots, grease, debris, etc. Our state of the art CCTV Inspection Systems are always kept up to date with the latest enhancements and industry developments and offer many advantages over competing technologies. 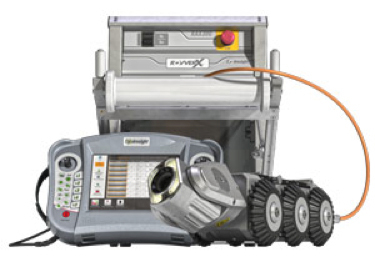 We can inspect pipe of any size, material and condition with the Envirosight ROVVER X’s array of wheels, auxiliary lamps and camera lifts. Three interchangeable chassis sizes handle pipes from 100mm to 3000mm. Our systems are able to Inspect farther by steering around obstacles, climbing offsets, and passing through inverts. 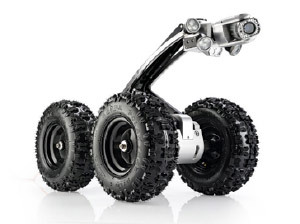 ROVVER X crawlers have a compact wheelbase and steerable 6-wheel drive. Specialized cable reels allow our crews to inspect 600 metres in a continuous run between access points. Observations, video and images are exported seamlessly into WinCan software for databasing, advanced reporting, mapping and PACP compliance. Mini Camera inspections provide the customer with a scope of their lateral drain or other small diameter pipe to ensure that your system is working properly. This allows you to diagnose any problematic areas (i.e. root protrusion, infiltration, calcium build up or cracked pipe).These systems have self-leveling stainless-steel cameras that capture color footage from pipes 100mm and up. LED lamps deliver variable-intensity and shadowless illumination. The signal from the tri-band sonde can be picked up by any locator. Once the problem is discovered we can determine the appropriate method of repair. This may include relining or excavation of the pipe. Prior to relining or excavation all obstructions will be removed with our Ridgid K-6200 drain cutter or one of our robotic micro cutters. Pole-mounted CCTV cameras are able to provide a cost-saving complement to traditional crawler-based pipeline inspection. 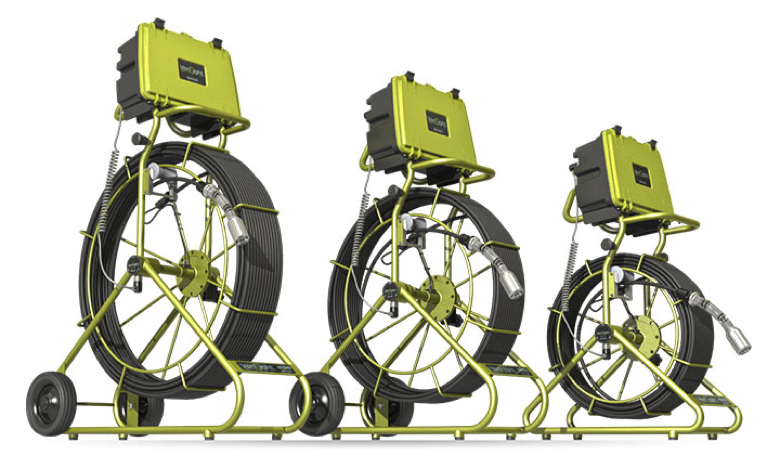 They are able to reveal at a glance whether pipes require cleaning, further inspection with a crawler based system or repair work, providing municipalities the opportunity to collect infrastructure data at a fraction of the price. With the zoom inspection camera, a single operator surveys lines safely from street level, saving the expense of a CCTV van and crew. A powerful zoom camera and lamps pinpoint hidden flaws and obstructions, then document them with colour video and measurements.